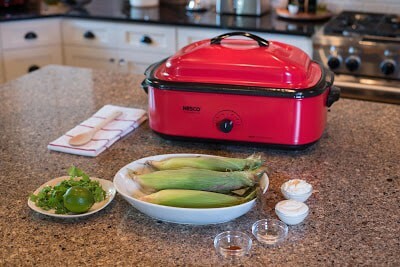 No summer fiesta is complete without this NESCO Mexican Roaster Corn! It’s the perfect dish to pass or devour yourself. Preheat the Roaster to 400F. In a small bowl, combine mayonnaise, sour cream, garlic powder and lime juice and set aside. Place corn husks directly in the Roaster on the wire rack and cook until corn is soft, about 35-40 minutes. 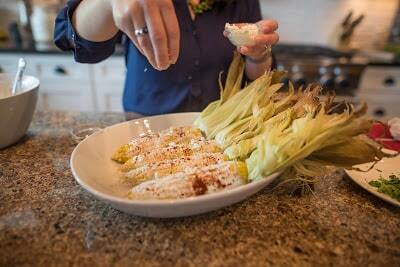 When corn is soft, remove, and peel down the husks and spread each ear with the mayonnaise mixture. 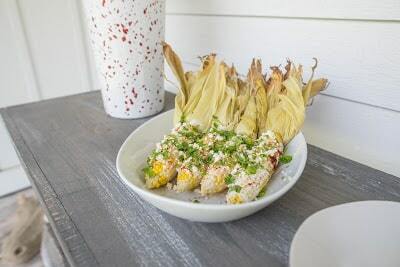 Garnish the corn with chili powder, Cotija and cilantro and serve immediately.